As the State Library of Victoria continues to celebrate the centenary of its iconic Domed Reading Room, Minister for the Arts Heidi Victoria came to the party with a surprise gift – $6.7 million to fund repairs to the 100-year-old dome, as well as other capital works at the heritage building. Announcing the funding at the launch of the Library’s latest exhibition – celebrating its architectural and social history – Ms Victoria said the Victorian Coalition Government’s support would protect one of Victoria’s greatest cultural treasures for future generations. 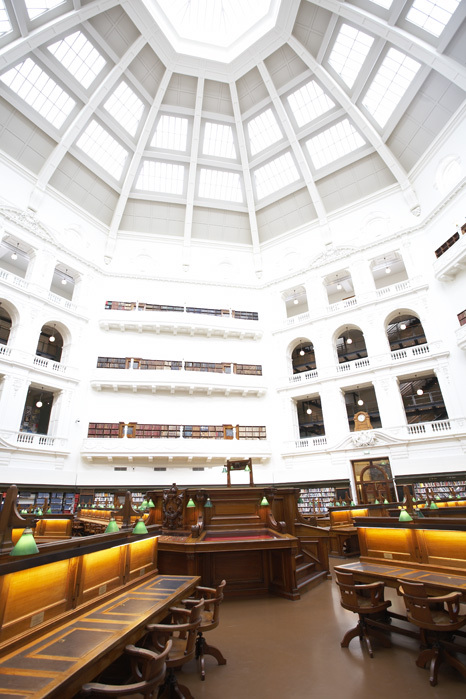 ‘Designed by architect Joseph Reed in the 1850s, our magnificent State Library is the oldest public library in Australia and one of Melbourne’s most important landmarks. In addition to undertaking important works to the render of the Dome, addressing issues caused by weathering, the funding will enable the Library to complete a three year project to repair the façades of the building. New fire and safety systems will also be installed. The capital funding is in addition to $3 million , provided in the 2013-14 Victorian Budget, which will support the Library at an organisational level to deliver a bold new vision; build its capacity; and meet the changing needs of Victorians. President of the Library Board of Victoria, John Wylie welcomed the Coalition Government’s additional funding. ‘For 100 years the Domed Reading Room has been a place of inspiration, creativity and learning for the people of Victoria. These welcome funds will ensure that it remains so for the next 100 years,’ Mr Wylie said. The works are expected to be undertaken over the next year. The State Library’s exhibition Free, secular and democratic: building the Public Library 1853–1913 is open daily until Sunday 2 February 2014. Entry is free.